Today, six years later, I still have that old iPod. But I no longer consider it “tiny.” In fact, it’s more of a “brick” both in size and weight. It held 40 gigabytes of my music on its miniature hard drive platters. 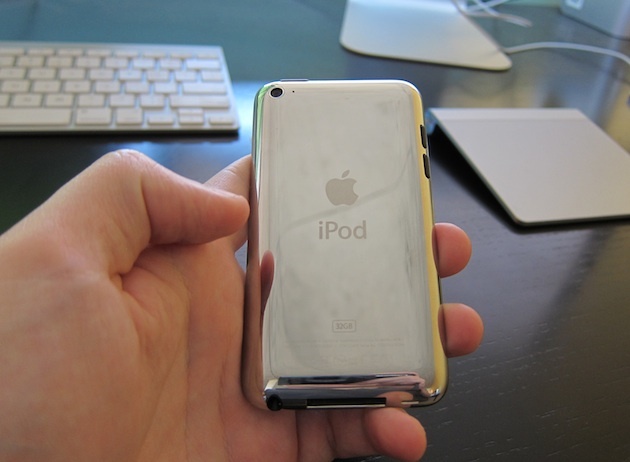 Today, the latest high-end iPod touch holds 24 more gigabytes and is a sliver of the size and a fraction of the weight. And it plays music for 28 more consecutive hours. Oh, and it has a color screen. One you can touch. One you can multi-touch. With the unveiling of its new iPod line last week, Apple has made it very clear what the future is: touch. 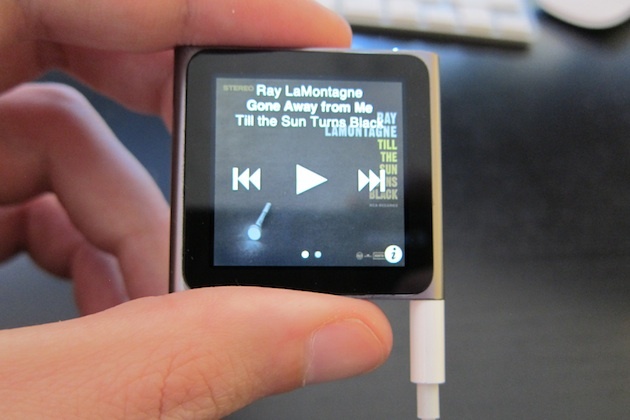 The iPod classic, while still around, wasn’t updated at all for the first time in nine years. 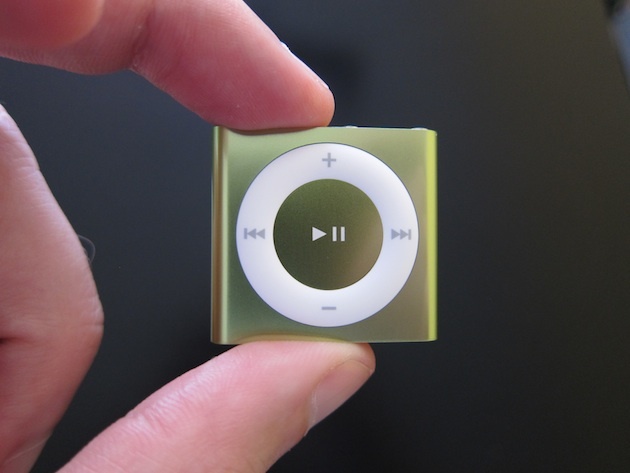 At the other end of the spectrum, the iPod shuffle underwent a return to form — literally — as in, its form factor is now the same as it was two generations ago. These are now the last two remaining iPods without touch screen integration. And both are clearly moving out to the pasture. That’s not to say the shuffle is dying yet. It still fills an important niche for Apple — the cheap niche. At $49, it is by far the cheapest iPod available — by $100. But it’s clear that if it was feasible, Apple would put a touch-screen in this device too. Amazingly, it’s now almost the exact same size as the iPod nano (more on that in a bit), the major difference is the lack of a screen. Instead, the shuffle focuses on its VoiceOver capabilities (the carry-over from the last generation, which fully relied on them). But again, this iPod refresh, which Apple CEO Steve Jobs called their biggest one yet, clearly points to the future of the line — and really, the future of Apple in general: touch. 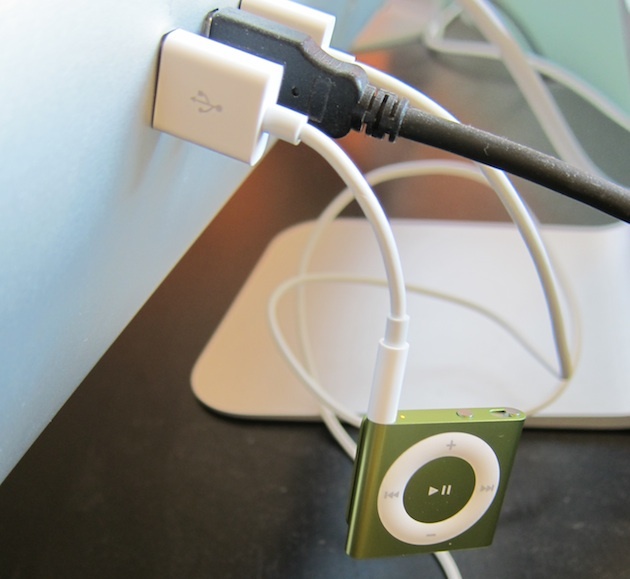 The two big updates in the iPod lines this time around are the iPod nano and the iPod touch. First, let’s talk about the nano. The previous version of the nano was nice with its elongated form factor. That said, every time I used one, I had to fight the urge to touch its screen to navigate through it. Finally, I can do that. And just as the way Apple killed off the need for a physical keyboard with the iPhone’s touchscreen, here, they’ve killed off the need for the old standard click wheel. 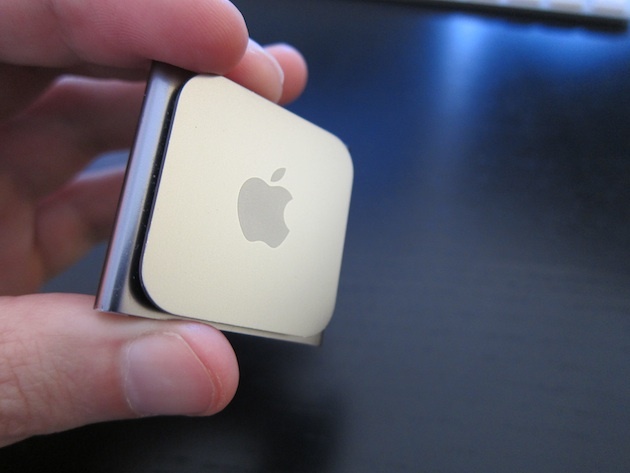 As such, they’ve been able to make the nano much, much smaller. 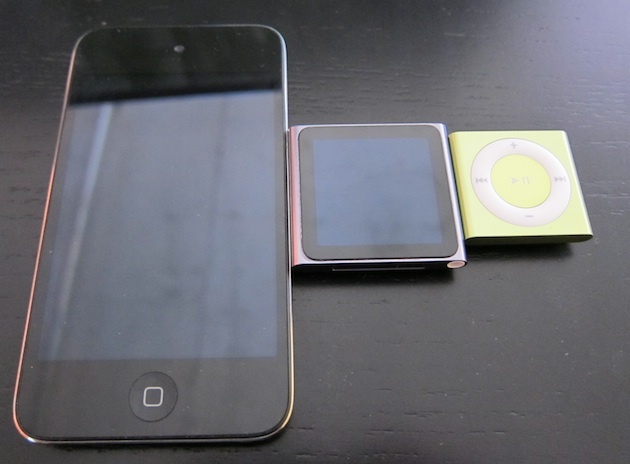 As I noted above, it’s crazy but the nano is now almost the same size as the shuffle. 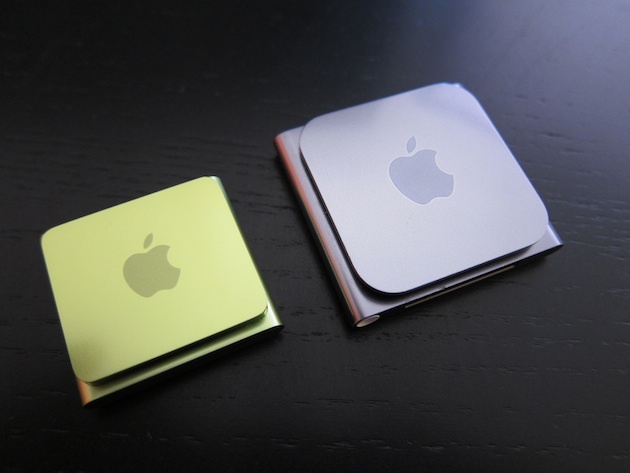 It’s now the same square form factor, just a bit bigger. And it’s a good thing it’s a little bigger because Apple needs the room to squeeze four different apps on the various nano pages. Yes, like the iPhone and iPod touch, the nano now has apps — sort of. Don’t get too excited, Apple says there will be no third-party apps for the nano (at least not yet), instead, they have some standard apps they created to use on the device. These include “Now Playing,” “Playlists,” “Radio,” “Clock,” “Photos,” “Fitness,” and a few others mainly to give you quick access to your content. Album artwork is nicely displayed when music is playing, and touching the screen once will bring up controls. Swiping to the right here gives you more options (such as Genius and Shuffle). 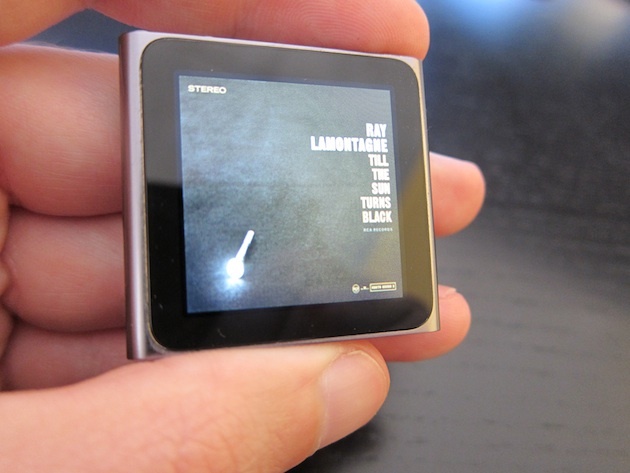 But the most interesting little feature of this nano is that you can use multi-touch to rotate the album artwork. Why would you want to do this? Because like the shuffle, the nano now comes with a clip on the back to easily attach it to a piece of clothing you have on. By putting two fingers on the screen and rotating, you’ll ensure your controls and/or album artwork are just the way you want them. This is one of the little things that makes Apple, Apple. The sound quality on the device is solid — in line with previous generations of nanos. And the 24 hour audio playback that Apple lists in the specs seems about right. I have been unable to wear the battery down all the way over several days. One unfortunate side effect of this new tiny size is that Apple had to remove video support. 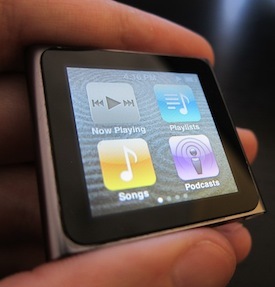 This means the iPod nano can no longer play videos, nor can it record them (there is no longer a camera). I suspect people may be disappointed by this until they see the actual device. Can you imagine watching a video on this screen? Because I sure can’t. The removal of the camera itself will disappoint some people, but it was always a bit odd anyway as it only recorded video and not still images. I think the new size and touch screen in exchange for the video capabilities is a good tradeoff. Especially when you consider the new iPod touch. 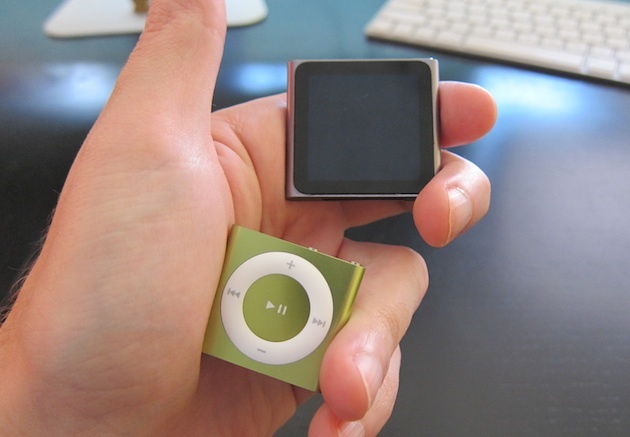 What the new nano lost in video capabilities, the iPod touch gained — and then some. The latest version of this device is not only the first with a camera — it has two cameras, one in the front and one in the back. And the one in the back shoots 720p HD video. For some people, that alone will be reason enough to part with at least $229 for the 8 gigabyte version. But when you add in the fact that it has the same “Retina” display that Apple made for the iPhone 4, and the A4 chip which Apple included in both the iPhone 4 and the iPad, and of course, FaceTime support, there’s no question that this thing is going to be a massive hit for Apple. Obviously, everything I said in my review of the iPhone 4’s 960-by-640 resolution Retina display is the same here. Simply put: it looks amazing. 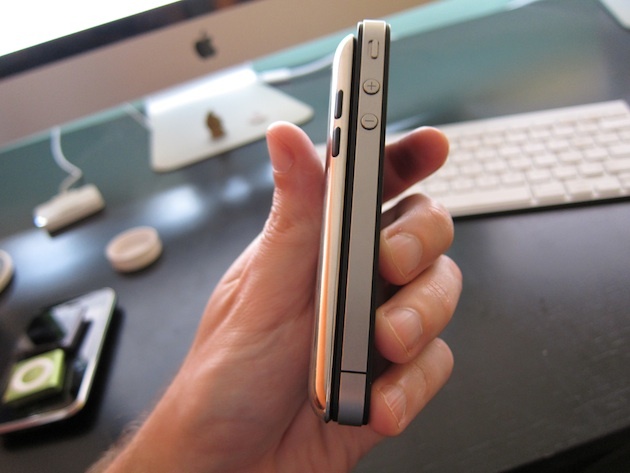 What’s great is that despite the same basic specs, the iPod touch is tiny when compared to the iPhone 4. 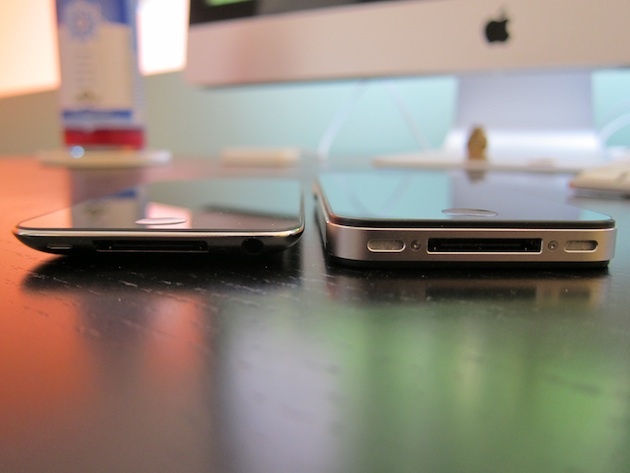 Putting them side-by-side, the iPod touch is significantly thinner and also a little shorter. It also trades the all-glass back and controversial antenna siding for a more conventional silver metal backing. While obviously the iPod touch doesn’t need the cellular components of the iPhone, it still is interesting that Apple has done away with the outside antenna (which also handled the WiFi, which the iPod touch does have). 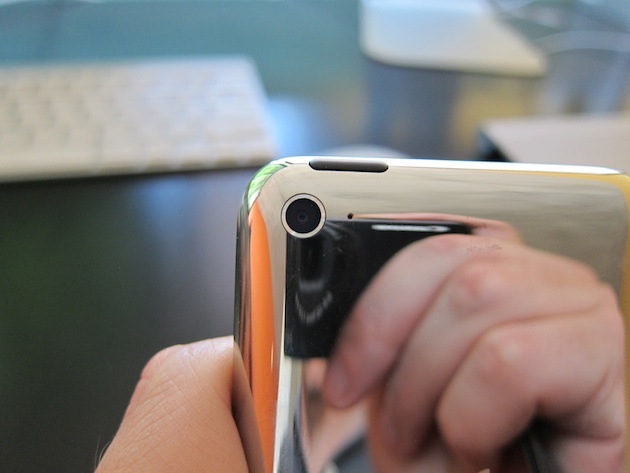 The metal back is also slightly curved around the edges on the iPod touch, this makes it feel even slimmer. As with previous generations of the device, the headphone jack is at the bottom, while the top only contains the screen on/off button (which is actually a little easier to hit thanks to the curved sides). 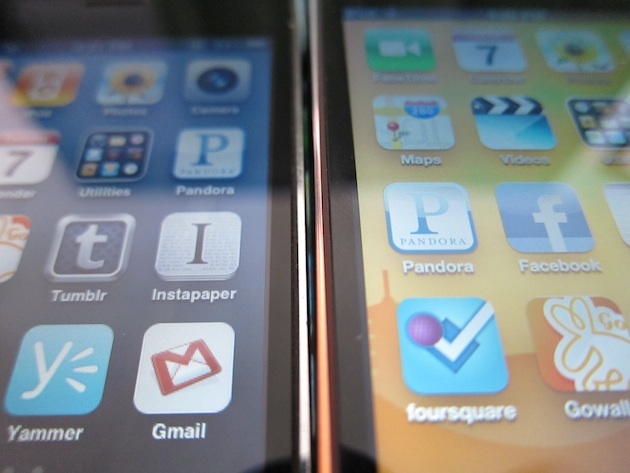 People are now likely to use the iPod touch for three main reasons: music, gaming, and video. For music, the song remains the same. This iPod touch seems inline with previous iPod touches. Apple says it has upped the battery life a bit (about 10 hours more of audio playback and 1 hour more for video playback), which is likely a result of the power saving techniques of the A4 chip. I wasn’t able to run the battery into the ground; it seemed solid — not iPad-good, but better than the iPhone. For gaming, the combination of the A4 chip and the Retina display makes this an awesome machine. Jobs noted during the keynote that when you consider iOS devices as portable gaming devices, they’re outselling the entries by rivals Nintendo and Sony — combined. That’s likely to continue, if not accelerate from here. Every game I tried ran smoothly and looks brilliant with this screen. Video is the big new addition here though, obviously. When taken outside (or in good light), the 720p videos look excellent. Inside, in low light, at things things can be a bit murky, but that’s probably to be expected (and there is no flash on the iPod touch). Just as with the iPhone, you can use the iMovie application (sold separately) to edit videos right on the device. All in all, it’s a great little HD movie machine — one that’s insanely small. Photos, however, are a different story. Sadly, the lens in the iPod touch is not the same 5 megapixel variety found in the iPhone 4. Because of that, Apple limits still-image resolution of 960 by 720 pixels — very low. I found still pictures taken with the iPod touch to be grainy — again, especially in low light. 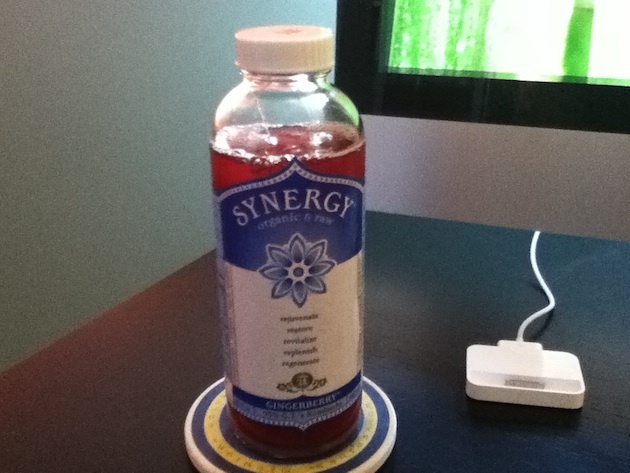 The iPhone 4 performs much, much better as a camera. When I asked Apple why they were limiting the camera to such a low resolution, they noted that the focus here was primarily video. The picture-taking capability was simply a bonus feature they tacked on for people who wanted the ability to take some quick shots, they said. With that in mind, it may have been wise for Apple to make video capture the default mode for the camera on the iPod touch (it is still picture capture). Having a full 5 megapixel camera that is as good as the iPhone 4’s would have also undoubtedly required Apple to make the iPod touch a bit bulkier (and added a little bit to the manufacturing costs, undoubtedly). To me, it would have been worth it, but they clearly felt it wasn’t. The other big component of the camera is FaceTime. 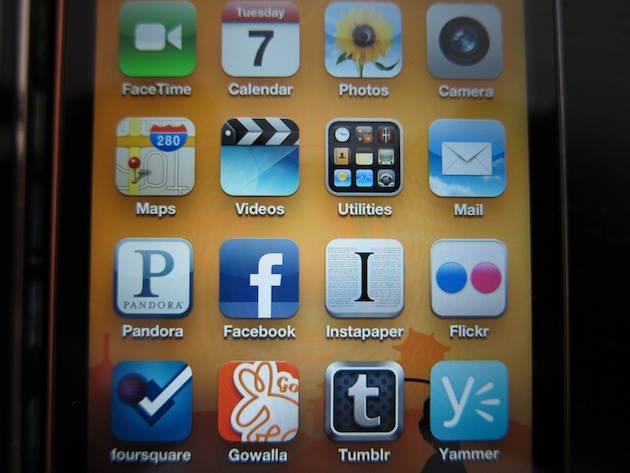 On the iPod touch, things work a little differently because there is no cellular service to latch on to (that’s how it works on the iPhone 4 — you first place a call to the person you wish to FaceTime with). To work around this, Apple has made email addresses the new way of doing this with the iOS 4.1 update (due this week). Sadly, I wasn’t able to test this new link-up ability on my demo unit, but I did try it in the demo area right after the Apple event last week, and everything seemed to work fine. Once you establish the initial FaceTime connection (in this case, via email address), the device remembers connections so it’s one-click from then on. This addition of a second device that does FaceTime is important for Apple. Clearly, they feel this is a major feature their portable devices will have going forward (they sure are promoting it enough). And by making it an open standard, they hope others will adopt it. With FaceTime on the iPod touch, millions more people will have access to the feature. In my opinion, Apple still needs a better management system for FaceTime calls (something like FacePlant), but when you connect, it’s very, very impressive. The transition is taking place before our eyes. The click wheel, once the signature of the iPod line, is all but extinct now. Instead, Apple is continuing their march forward into touch. This shouldn’t be surprising give that last week, Jobs revealed on stage that the iPod touch is now the most popular iPod Apple makes. As sales of other iPod models have been in decline for some time, the iPod touch was going the other direction. With its new touch capabilities, Apple undoubtedly hopes the same will be true for the new nano as well. And with the iPod touch, the iPod nano, the iPhone, the iPad, and Macs (with the Magic Mouse or Magic Trackpad or MacBook trackpads) all now using multi-touch in one way or another, Apple is slowly but surely aligning itself to be the leader in touch computing going forward. The writing is on the wall — it’s hand-written.